It's fall in the U.S., which means football season is back. After missing practically all of last season, returning to the ritual of the Sunday football marathon has been especially enjoyable. The fact that both the 49ers and Raiders are off to strong starts only sweetens the experience. However, even when watching football, my mind never strays too far from video games. Recently, it occurred to me that football broadcasts have become increasingly similar to video games in regards to how they communicate situational information. As a way of sorting through some of the changes and challenges of designing on-screen information systems, I'll share some thoughts about the HUDs (heads-up displays) used in both video game and televised football. By today's standards, the screen is naked. Instead of existing as a persistent overlay, game time, scores, and other statistics bookend the action and disappear during play. 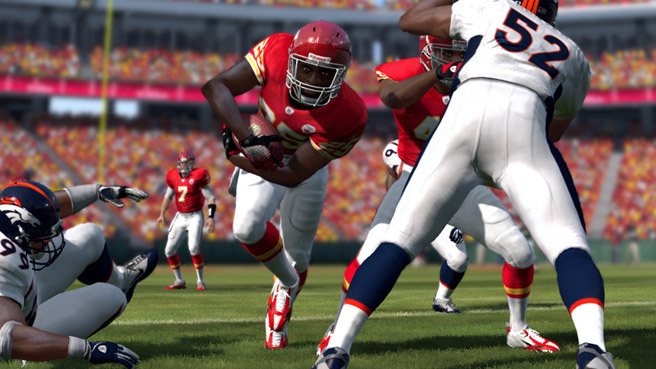 Although the game information disappears after the ball is hiked, it stays visible before and in-between plays, delivering frequent updates about the game's situation. From this picture alone, you can see what teams are playing, the score, how many time outs each team has, the down number and yardage needed for a first down, how many seconds are left on the play clock, the remaining time in the quarter, and (of course) which network is broadcasting the game. 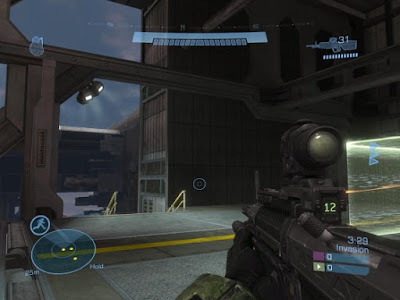 Even a person who has never played a Halo game would likely recognize and discern the basic meanings behind the grenade, gun, compass, crosshairs, and arrow symbols. While the Halo UI organizes information and implicitly imparts the game's rules, televised football HUDs are more focused on efficiently conveying data to people who already know the rules. Football broadcasts are increasingly utilizing augmented reality techniques to supplement the HUD overlay. 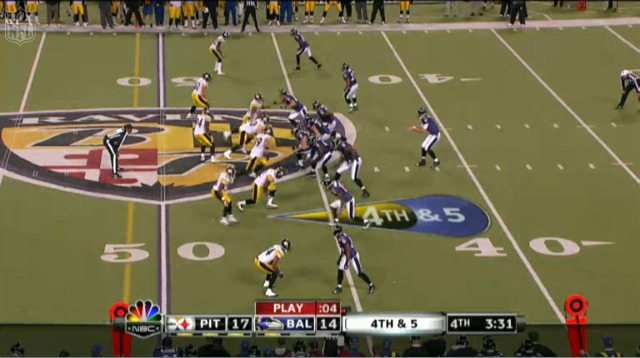 The yellow first down line and down count are digitally imposed on the field. 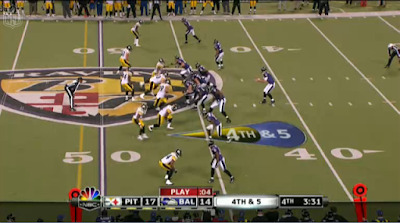 Most broadcasts also show a blue line representing the line of scrimmage and certain channels have taken to digitally imposing the play clock on the field. All of this is done very smoothly, with stylish animations that create the illusion that the graphics are part of the field itself. At the same time, football broadcasts digitally augment the real world with virtual symbols. 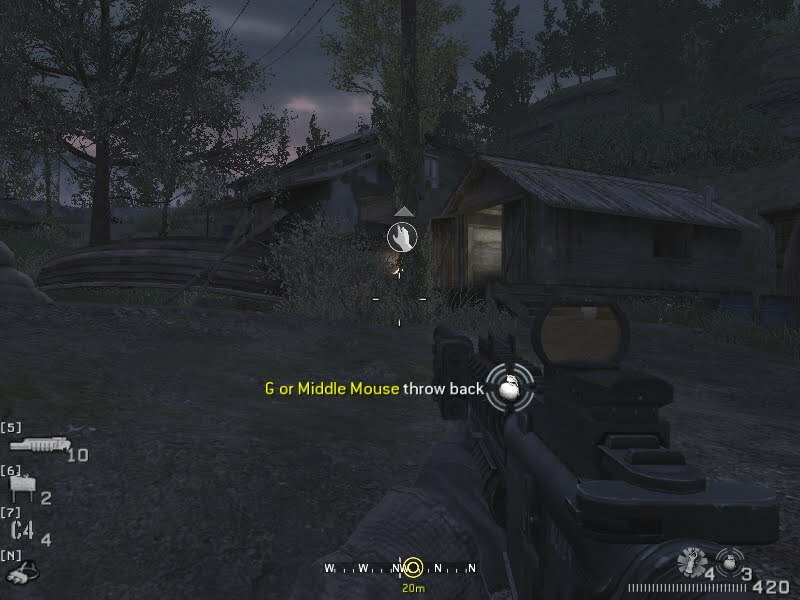 The first down line and yardage numbers appear as parts of the field, just as grenade symbols and mission markers function in Call of Duty. 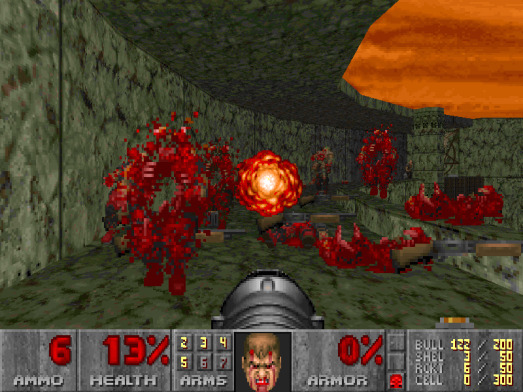 This gives rise to a strange paradox: by making games more readable, HUDs can widen the gap between reality and simulation or participant and spectator. A football player can't see the digital down line on the field; they have to physically look away from the field to see the clock. They don't have the luxury of seeing the receivers' hot routs highlighted with virtual colors; they must remember the play formations. Similarly, a real soldier's comrades don't have green "friendly" tags hovering over their heads and enemy grenades are not denoted with convenient "toss back" symbols. 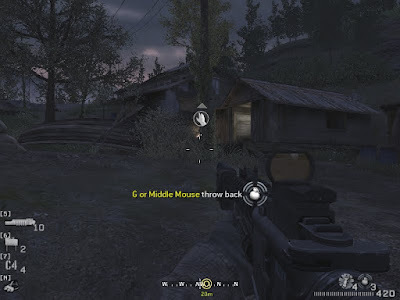 Some people pursue the elusive concept of "immersion" by purposefully seeking to disable video game HUDs or by playing minimalist games like Far Cry 2. By forcing themselves to sort through the chaos of a dynamic situation by relying their own wits rather than on-screen readouts, they experience a close connection to their avatar and the virtual world they inhabit. Perhaps these same people would prefer to watch a HUD-less football game? I could understand such a preference. Having a ubiquitous, informative HUD makes you aware of everything going on around the huddle, but having to keep all that information in your head might make you feel like you're in it. EXP Podcast #142: A New Hope in The Old Republic?